American brunch has its obvious merits, but Chinese breakfast blows it out of the park. In Beijing, no matter how disoriented or queasy from jetlag I was, I would always have appetite for 7am takeout from street vendors and nearby cafes. Typical spreads included white rice drenched in duck bone broth and glistening with a thin sheen of fat; crispy but airy deep-fried crullers dunked in foamy soy milk, warm and lightly sweetened; endless varieties of steamed buns stuffed with soupy pork meatballs or pungent chives or rich black bean paste; and soft tofu nao, scooped quivering into a plastic cup or bag and drowned in densely flavored stock, garnished with fresh scallion and cilantro. Chinese breakfast is serious business. Tofu Nao literally means "tofu brain", which is much more appetizing than it sounds. The kick really comes from the broth; tofu in general doesn't naturally soak up flavor all that well unless it's coated and deep-fried. And while the recipe is easy and quick, it does require some planning ahead (making chicken or pork bone stock, overnight soaking of dried Chinese vegetables, not to mention finding these vegetables in the first place if you are unfamiliar with Chinatown). Pictured above are the some of the ingredients used: counterclockwise from left are dried lilies, shiitake mushrooms, scallion and cilantro, and mu er (木耳, literally translated as "tree ear") - a kind of Chinese mushroom. You can buy dried dried lilies and dried mu er at most shops in Chinatown, and rehydrate them overnight. For the tofu itself, I cheated a little, using silken tofu which is the softest type available at most supermarkets. The actual tofu used in authentic versions is even softer and has an almost pudding or jelly-like texture; it breaks as soon as you touch it with your spoon. This is made by pouring hot homemade soy milk into a gypsum and cornstarch solution and waiting for it to transform into a pudding. I served my tofu nao in a plastic container (as it should be!) and the sight and taste brought me back to sweaty summers in China, spent devouring everything within arms' reach. 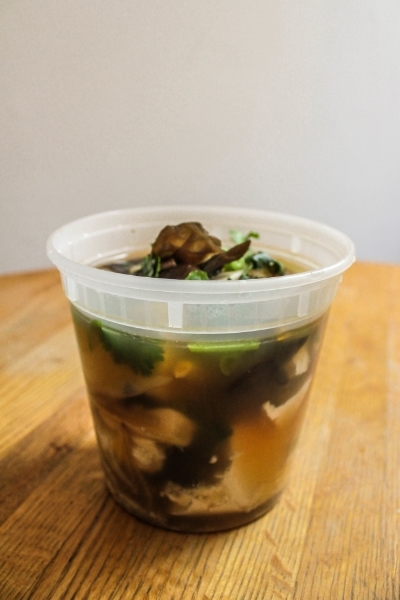 Combine stock, soy sauce, vinegar, water, star anise, peppercorns, mu er, lilies, mushrooms, half the scallion and half the cilantro into a small pot and bring to a boil. Lower the heat and simmer for another 5-10 minutes, covered. Add the tofu gently and simmer on medium-low for another 10 minutes, breaking into large chunks. Serve garnished with the remainder of cilantro and scallion.